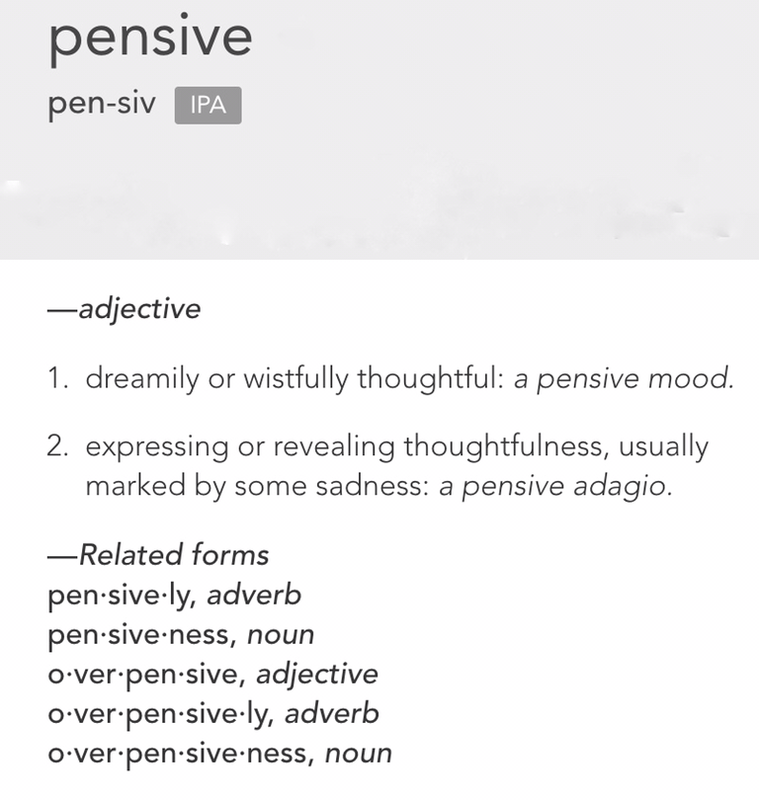 Today’s WordPress one word blog prompt is Pensive. And you know? I normally don’t find all the blog prompts to be pertinent to me, but this one resonates within me that I couldn’t help but write my thoughts down to share. In my opinion, I don’t think that most people truly understand the beauty of allowing themselves to be pensive every once in a while. There is something to be said for allowing yourself to take time apart from a hectic day and busy life to just sit there and allow yourself the joy to think about things. To have the quiet time, preferably alone, to analyze and process your emotions and experience them to the full. So often I see people frantically worrying either about the future, or about the past, when all it does is makes them unhappy in the present. They seem to frantically rush from experience to experience, as if they are afraid that the next can’t come soon enough. A teenager wishing that she were graduating, and off to college away from home. But when she gets there, she wishes she were done with college and in a real job with money and her boyfriend becoming a husband. Then wishing for kids and a house, then wishing those kids didn’t grow up so fast, and Why oh why didn’t I enjoy traveling or my husband when it was just the two of us? I don’t know if it’s because I’m a laid-back type of person, or if it’s a gift, but I can remember thinking about this topic as young as a teenager in high school. People would always say to me “Enjoy high school, these will be the best times in your life and you will always wish you could go back to them.” I remember thinking as a lowly Freshman, Now why should I try to rush through something that I will only want to have back later? Why not just enjoy each step of the way, and when I’m done, and ready to move on, I’ll be ready for the next stage? Granted, I was all too happy to step up from freshman to sophomore and not get picked on anymore, but I remember thinking about just enjoying each day and not worrying about rushing to grow up. Consequently, when I stood on the platform at graduation, waiting excitedly to get my diploma, I felt a little melancholy about moving away from where I spent the last 18 years of my life (to four hours away) and going off to college (Canada!) where I didn’t know a soul, but I wasn’t sad about leaving high school behind. I enjoyed my time there (for the most part) and I would miss the people that I knew, but I didn’t want to go back through it all over again, or even in part. I enjoyed life while I lived it, not in nostalgia. I think what made me ready to move onto the next stage of life was the fact that I made an effort to think about and BE pensive while I experienced the stage I was in. Pensiveness is also part of taking time for processing and learning to appreciate life as it happens, not being so busy that you only have time to be pensive and brood on the past, wishing to go back and do things differently. I’m not talking about making different choices, we all wish we could do that, especially with our more stupid mistakes (like that stupid, stupid dare I accepted in high school). I’m talking about wishing that we enjoyed the time spent with family and friends, and enjoying every moment of an event or experience instead of worrying or wanting a future event. There is a country song (isn’t there always?) that illustrates this idea of slowing down and allowing yourself to enjoy every moment. To sit back and think on your life right now, what a joy this stage is. Yes, college is stressful and you can’t wait to be done with classes, but what about the joys of gaining lifelong friends? Of taking trips abroad because you’re free from a job or spouse? And if you do marry, enjoying the quiet time of just the two of you, the joy of living with the one you love before the wonderful distractions of children? I can’t say enough about taking time to be pensive every now and then, enjoy the moment, embrace each day and each stage of life fully. That way, when it’s time to move on to the next, there are no regrets, no exhausting rush for the future. Just wonderful, meaningful experiences full of the joy of living.